Start every morning right in your new custom bathroom designed not only for functionality but to also improve your mental and emotional stability. Starting off your day in the bathroom is a pretty common practice when preparing for school or work, brushing your teeth, showering and combating a cluttered countertop. With a new custom bathroom design you can upgrade all these vital daily options you have grown used to and improve your lifestyle. Starting your day off right is vital and having an optimal bathroom setup is no exception with options that are built to your specifications and desires. It could be the difference between being cramped and inconvenient to a more spacious and enjoyable experience in one of the most important areas of your home. Some other benefits of a Custom Bathroom include increased property value, greater buyer appeal, fixing pre-existing problems and improved look or feel. How does a custom bathroom accomplish all of this you may ask? The return on investment of a custom bathroom remodel can pay off in multiples and homeowners are often surprised. Many remodels can result in a 2/3 to 3/4 return on their initials investment costs. 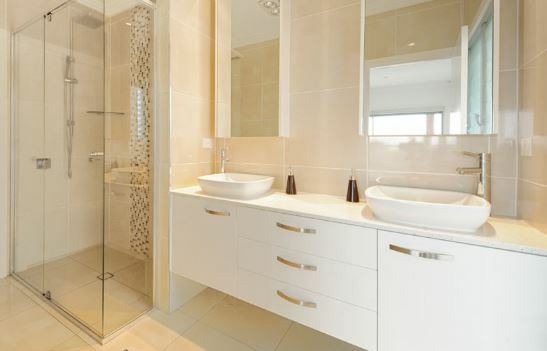 It becomes a lot easier to enjoy your new bathroom when you know it also increases the value of your home. If you’re considering reselling your home then one important area buyers look at is your bathroom, especially the master bath. A more luxurious bathroom with glass panel shower and marble countertops can become a highlight of any sale. Remodeling a stock or out-dated bathroom can result in real wow factors not only for your buyers but also for you and your family while you get to use the upgraded bathroom options. A new bathroom remodels or renovation is the perfect way for you to fix things that have been overlooked like a leaky faucet or old moldy drywall. Maybe your family has changed or outgrown the current setup? Remodeling allows for you to update your bathroom to match your current lifestyle and add additional storage and design ideas you may have wanted for a long time. Having new cabinets and countertops installed will immediately improve the overall feel of your bathroom. This can be further enhanced with heated floors, a glass corner shower and even the additional of skylight or privacy windows. No matter what your purpose for renovating your bathroom or creating a custom design idea you can call Beckworth for a free quote (703) 570-6777, or use our contact form. We will get you the best custom bathroom design and materials for you and will work with and for you to get the best deals on the market.